Flight. I've seen the whole 'girl flying with Jim' thing done a million times, and it's always with Ariel au Meloday; not much variety. So I made this!. 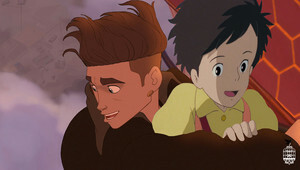 Wallpaper and background images in the Disney crossover club tagged: disney crossover studio ghibli treasure planet jim satsuki my neighbor totoro.